Answered by Michel Hall, Nuclear Engineer, Portage Inc.
What are the working conditions like? Working conditions consist of about 70% computer/office work and 30% field work. Office and computer work are required for computer simulations/writing reports and analyzing data. 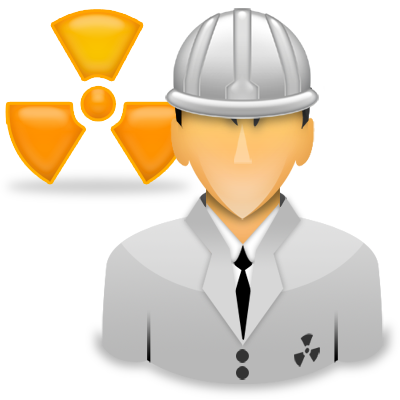 The field work is mostly related to inspections, surveys, and observations of nuclear safety systems, operations, and issues related to nuclear waste processing and disposal. How much training is required? Training is ongoing, as new technologies, processes, and computer codes become available, it is important to stay current. I usually spend about 3-4 weeks per year learning a new skill. As far as school goes, a person can work certain jobs in the nuclear industry with minimal education. However the really fun stuff starts to happen with a 4 year nuclear or science degree. A person can achieve up to a post-doctorate degree in a nuclear centric topic. All nuclear engineersare skilled in math, physics, chemistry, and engineering. What happens on an average day? From my experience, the average day, consists of a plan of the day (POD) meeting first thing. This meeting lines out the activities for the rest of the day. From there, activities vary from surveys and inspections, to meeting to provide technical expertise to a specific problem, to conducting research to run a computer simulation, or to working with waste management and nuclear safety personnel to ensure the safe operation of every nuclear process. Is this a fun job? Yes. Like any job, there are days and tasks which are not so fun, but if you like to solve problems, help make the workplace safe, and work in an industry many people do not understand, Nuclear Engineering can be a very rewarding experience. What is nuclear fission? It is a nuclear reaction that splits the nucleus of an atom into smaller, subatomic particles. When the atom splits, the result is a release of energy in the form of heat. Nuclear fission happens naturally every day. Many scientists have suggested that a splitting atom behaves somewhat like a drop of liquid when it breaks up into droplets. 1. Fill the water glass about half full with the rubbing alcohol. 2. Add enough water to fill the glass two-thirds full. Stir the alcohol-water mixture with the spoon. 3. Wipe the spoon dry and fill it with cooking oil. 4. Now comes the tricky part. Carefully bring the spoon close to the surface of the alcohol-water mixture, then gently tip the spoon over. If you’ve done it right, a single blob of oil will slide into the glass. 5. If the blob of oil is floating on the surface, carefully add a bit more alcohol using the spoon. If the blob has sunk to the bottom, spoon in more water. You want the blob of oil to become a drop of oil floating somewhere in the middle of the glass. Notice how perfectly spherical it is. The forces that hold the drop of oil together are analogous to the forces that hold an atom together. 6. With the knife, carefully prod the drop apart. At first, the drop will bulge, then it will tear apart into two round oil drops. The oil-drop “atom” will have split into two smaller “atoms.” Note that the drop wouldn’t split until it was critically deformed by the knife. Atoms behave in much the same way: They resist splitting until some action critically deforms them. April 23, 2013 in Questions.